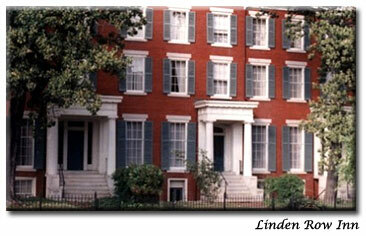 Welcome to the Historic Linden Row Inn in downtown Richmond, Virginia. In a city where history abounds, the Linden Row Inn stands alone in offering its guests the "True Richmond" experience. We are a historic urban inn with a European style that is designed to make your visit to Virginia's capital a completely gratifying experience. Conveniently located in downtown Richmond at 1st & Franklin Streets, the Linden Row Inn is just minutes away from all major attractions in the Capital area. With 70 guest rooms, seven parlor suites, and 2500 square feet of function space, all opening to an intimate, beautiful winding garden courtyard, the Linden Row Inn captures all the romance of a by-gone era; while serving up the Southern hospitality for which Richmond is famous. A proud member of Historic Hotels of America, Linden Row Inn offers its guests all the modern conveniences and amenities that discriminating travelers expect. Please read more about the hotel features and amenities. It's no wonder that the Linden Row Inn is one of Richmond's most popular gathering places for special events, weddings and corporate meetings. Reminiscent of a more gracious era, our guest rooms are filled with antiques and reproductions from the Victorian and Empire periods. At the same time our 70 rooms and suites provide state-of-the art modern amenities, such as cable TV with premium channels, coffeemakers, clock radios, and complimentary high-speed Internet access. The Parlour Lounge is a popular gathering place where guests can enjoy the relaxing atmosphere. Here, you can expect to meet fascinating people from all walks of life, and from all around the globe. The Linden Row Inn, a historic hotel in downtown Richmond, is a four-story urban inn featuring 70 elegant guestrooms, including 7 suites. Reminiscent of a more gracious era, our guest rooms are filled with antiques and reproductions from the Victorian and Empire periods. In addition to historic elegance, our accommodations provide state-of-the art modern amenities, such cable TV with premium channels, coffeemakers, clock radios, and complimentary high-speed Internet access. 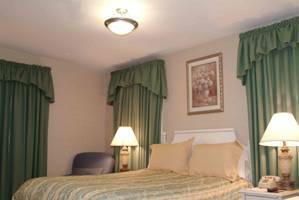 Additional amenities include hair dryers and irons and ironing boards. Parlour Suite Rooms Elegantly decorated in a period décor, our 7 parlor suites are each one of a kind. Each Suite features queen size beds and exquisitely appointed parlor areas. Named after predominant people in Richmond, the rooms feature antiques original to the Inn, 12' ceilings, floor to ceiling windows, gasolier lighting, sliding pocket doors, two marble fireplaces, and access to the veranda. Main House Rooms Our main house rooms feature a king, queen, double, two double, or handicap accessible beds. They are located in the 7 connected row houses; these rooms feature 12' ceilings, rich jewel-toned color schemes, contemporary amenities, and access to the veranda over looking the courtyard. Garden Rooms Our garden rooms feature a single double, two doubles or queen size bed. 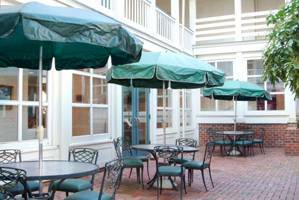 They are located in one of the two original carriage house buildings founded here in the late 1800's. All garden rooms are decorated in a light and airy color scheme and are cozy and intimate enclaves with private marble baths and private entrances. When you choose the Linden Row Inn as your hotel getaway or vacation destination, you'll find yourself within walking distance from the Virginia State Capitol and other fascinating historic sites. You'll also find yourself at the center of all downtown Richmond's action, dining, shopping, and nightlife, while enjoying southern elegance in Richmond's only historic urban inn. Conveniently located in downtown Richmond at 1st & Franklin Streets -- only 15 minutes from Richmond International Airport (RIC) -- with easy accessibility to all area business, state and federal government agencies, financial institutions, universities, and medical centers. From the airport, guests can take taxis ($16-$25, one way) or Groome Transportation to the hotel. Car rentals are another transportation option (may be best for travelers who plan to explore the surrounding area) and are available online.